The main match round count is approximately 120 rifle, 120 pistol and 48 shotgun rounds. There will be 12 stages. ALL FOUR GUNS WILL BE USED ON EVERY STAGE. These counts do not include side match ammo. 2019 application is now available here. There are two pages so don't forget to complete the secong page, which has the waiver. At the 2008 TG Summit, SASS announced that it was dropping the requirement of State Level and above matches having to give awards in all categories, even if there was only one person in the category. We will use a minimum of 3 entries required before we make an award. Exceptions will be with the Buckaroo/Buckarette, Young Gun and some ladies categories. 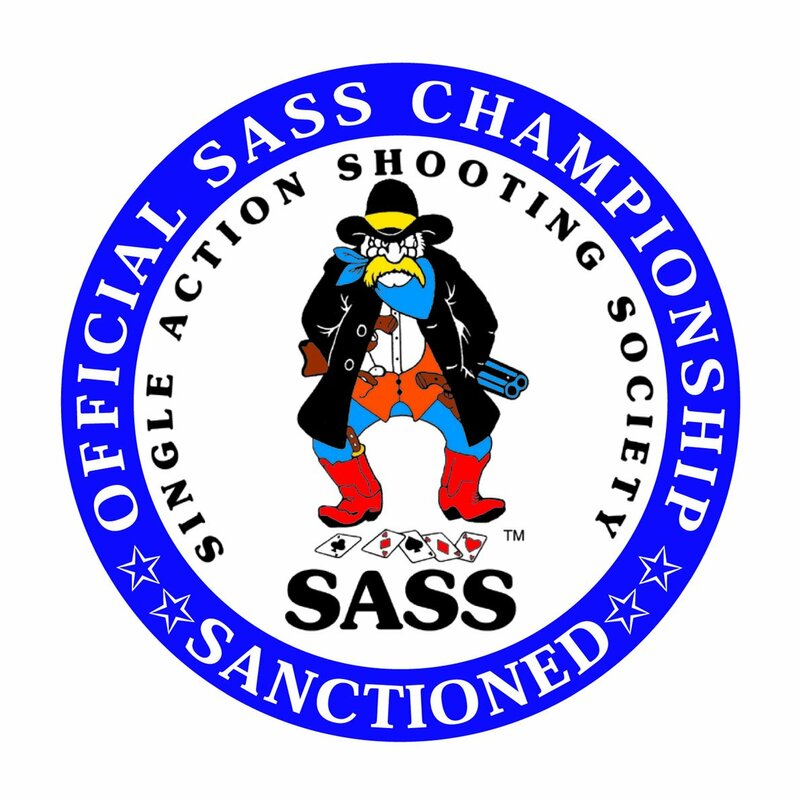 At the 2011 TG Summit, SASS announced that in 2013, clubs were no longer required to offer categories that have fewer than 5 entries. Clubs have the option to offer the categories with less than five entries but are no longer required to offer them. If you want additional categories, you need at least three confirmed shooters for the category before submitting your application. If in doubt about the category, please contact Chuckaroo. All other SASS official categories will be offered as long as we get 3 or more entries in that category. If you have any doubt, put a 2nd Category Choice on your application. Posse with requests are limited to three names. This includes spouse and family members. Use ONE APPLICATION PER SHOOTER. Add the money on each individual application, not on the top copy. Side matches will consist of Speed Pistol, Speed Rifle, Speed Shotgun, Derringer, Pocket Pistol, Long Range Rifle (Big Bore and Match Rifles at 100 yards), and a three stage blast (pre-registration only). There will be one winner in each category for Men's, Ladies, and Junior Boy and Girl. Matches will be for the best time all day. Shooters can shoot until they drop, run out of ammo or time. All side matches end at 4:00 PM sharp. There are no sub categories for firearm type (except long range rifle), type of powder used or shooting category. Cost is $1 per side match or you can purchase an all day pass for $10 on the match application. All day side match is FREE! The 3 Stage Blast. This will be shot on side match day and consist of three stages shot in any order. There is a $10 pre-registration fee for the 3 Stage Blast. Separate awards will be given for the top male, top female and top boy and girl Junior shooters in the Blast. See the match schedule for additional information. Closest decent hotel is the Gaithersburg Holiday Inn, 2 Montgomery Village Ave., Gaithersburg, Md. 20879. They are located at the intersection of Md. Route 355 and Montgomery Village Ave. This is a couple of blocks East of I-270. They can be reached at 301-948-8900. We have not negotiated a reduced rate. MAP The I Love You Man Banquet will be held at the Range. Level One, Door Prize Sponsor (unlimited number available). Providing door prizes of any value will have you listed in the match handbook and on our web site. If you have a web site, your web link will remain on our web site until the 2020 match is posted. All sponsor listing will remain indefinitely on the archived scores. Level Two, Awards Sponsor, (available until awards cost are met). Sponsors in this category make cash contributions at $75 or higher for purchasing our awards. Sponsors will have a listing in the match handbook and on our web site. If you have a web site, your web link will remain on our web site until the 2020 match is posted. All sponsor listing will remain indefinitely on the archived scores. Level Three, Side Match Sponsor. One opening for each side mach. At this level, the sponsor supplies $100 in cash, merchandise or gift certificates**. Your name will be listed as a side match sponsor in the handbook, your name or business will be posted at the side match you sponsor. If you have a web site, your web link will remain on our web site until the 2020 match is posted. All sponsor listing will remain indefinitely on the archived scores. Level Four, Stage Sponsor. There are ten openings at this level. As a stage sponsor, your company supplies a minimum of $250 in cash, merchandise or gift certificates**. Your name or business will be listed as a stage sponsor in the handbook, your name will be posted at the stage you sponsor and you will receive a handbook and match badge. If you have a web site, your web link will remain on our web site until the 2020 match is posted. All sponsor listing will remain indefinitely on the archived scores. Level Five, Presenting Sponsor (unlimited). As a Presenting Sponsor, your company supplies a minimum of $500 in cash, merchandise or gift certificates**. Your name or business will be listed as a Presenting Sponsor in the handbook. You will receive a handbook and match badge. If you have a web site, your web link will remain on our web site until the 2020 match is posted. You will also receive one complimentary match entry. All sponsor listing will remain indefinitely on the archived scores. Level Six, the highest level, is Match Sponsors. At the Match Sponsor level, sponsor provides $1,000 in cash, merchandise or gift certificates**. Your name will be listed as a match sponsor in the handbook and on this web site. You will receive a handbook and match badge. If you have a web site, your web link will remain on our web site until the 2020 match is posted. You will also receive two complimentary match entries. All sponsor listing will remain indefinitely on the archived scores. Additional Sponsorships are negotiable. Please contact Dogmeat Dad for details. *At all levels, we can place your companies catalog or flyer inside the shooters package. VENDOR SPACES are available at no cost (refundable deposit may be required). Match dates are June 20, 21 & 22, 2019. Any items you wish to be included in the shooters packet must be received by June 1st. **Gift Certificates must be redeemable at Thunder Valley Days, on line or over the phone. by May 24th, 2019 to be included in the shooters handbook. Conventioneers will be able to participate in unlimited shooting on Side Match Day, Thursday, June 20, 2019. They will also get a personalized shooters badge, if they are registered before June 1st. See the Thunder Valley Days 2018 Application for additional information. Conventioneers can participate in all Thunder Valleys Days events except the 10 main match shooting stages. Entry fee includes a free Saturday Banquet ticket. Conventioneers must also be SASS members and be dressed in period clothing. Use the same application as the main match shooters use, just select Conventioneer. Visitors to Thunder Valley Days, or any of the Cowboy Shoots, are certainly welcome. There is no charge for visitors. ALL VISITORS MUST HAVE HEARING AND EYE PROTECTION OR THEY WILL NOT BE PERMITTED TO ENTER THE RANGES. NO VISITOR PETS ARE PERMITTED IN THE RANGE AREAS, YOUR COOPERATION IS APPRECIATED. PLEASE VOLUNTEER TO HELP THESE FOLKS, by contacting them direct. All Long Range Rifle Please Contact - Cash Caldwell 301-898-7566. Water Jugs on 22nd, 23rd and 24th. Set up in AM, get ice and replenish each morning. Contact John Leaman 301-972-1572. Match tear down on the 24th. Approximately 2:30 PM for less than 2 hours. Contact Dogmeat Dad to volunteer. We have several additional rules on our range. We have a minimum 650 fps rule on rifle and pistol ammunition. We do not permit hip shooting and we have a shot size of 7 1/2 or smaller. Violations will incur a 10 second minor safety penalty. Take I-270 North to Father Hurley Blvd. (Rt 27), East toward Damascus. Continue through Damascus but do not follow Rt. 27 North when it gets in town, just continue straight (bear right at the Chevron Station). Once you pass the next light, you are actually on Rt.108 East. Take Rt. 108 2 miles and turn left on Mullinix Mill Rd. Take Mullinix Mill Rd. 1 1/2 miles and turn left into the driveway. Take Rt. 355 North toward Frederick. Just north of Gaithersburg, near Milestone shopping center, take Rt. 27 Right toward Damascus. Continue through Damascus but do not follow Rt. 27 North when it gets in town, just continue straight (bear right at the Chevron Station). Once you pass the next light, you are actually on Rt.108 East. Take Rt. 108 2 miles and turn left on Mullinix Mill Rd. Take Mullinix Mill Rd. 1 1/2 miles and turn left into the driveway. Take I-70 East toward Baltimore. Take Rt. 27 South toward Damascus (also the Mt. Airy exit). Go South on Rt. 27 for 5.6 miles. In Damascus, at the light past the firehouse, turn left at the light onto Rt. 108 East. Go about 2 miles and turn left onto Mullinix Mill Rd. Go another 1 1/2 miles and turn left onto the driveway. Caution, Rt 27 has several speed cameras. Take I-70 West toward Frederick. Take Rt. 27 South toward Damascus (also the Mt. Airy exit). Go South on Rt. 27 for 5.6 miles. In Damascus, at the light past the firehouse, turn left onto Rt. 108 East. Go 2 miles and turn left onto Mullinix Mill Rd. Take Mullinix Mill Rd. about 1 1/2 miles and turn left onto the driveway. Caution, Rt 27 has several speed cameras. Take I-495 to I-270 North towards Gaithersburg and Frederick. Next take Father Hurley Blvd. to Md. Rt. 27 North/East toward Damascus. Continue through Damascus but do not follow Rt. 27 North when it gets in town, just continue straight (bear right at the Chevron Station). Once you pass the next light, you are actually on Rt.108 East. Take Rt. 108 2 miles and turn left on Mullinix Mill Rd. Take Mullinix Mill Rd. 1 1/2 miles and turn left into the driveway. Take New Hampshire Ave. (Route 650) West toward Ashton & Olney. Continue on Rt. 650, cross over Rt. 108 and stay on Rt. 650. (If you turn left onto Rt. 108, follow the directions from Silver Spring). Eventually, (a long scenic ride), Rt. 650 ends and turns into Rt. 108 in a small town call Etchinson (blink and it's gone). Make a right on Mullinix Mill Rd., (first right after Long Corner Rd.). Go 1 1/2 miles and turn left onto the driveway. Wildlife Achievement Chapter Inc. of the Izaak Walton League of America. 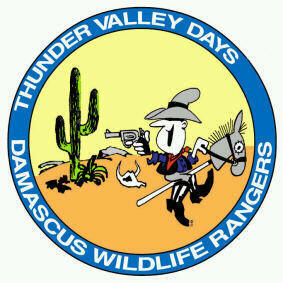 to support their conservation and wildlife projects in the Damascus area.